The BQ211 is a quarter-wave loaded subwoofer system, extending the low frequency response of Alcons’ pro-ribbon systems, in both permanent and portable applications. Featuring a state-ofthe- art 21” Neodymium transducer, this subwoofer is designed to offer maximum, prolonged high impact SPL performance from a relative small footprint. For this, the latest materials and innovations have been applied: A very large displacement transducer with all-carbon fiber cone + dust cap, 5.3” voice-coil with vented triple-spider frame plus optimized low resistance impedance, and port-vented magnet structure to maximally reduce power compression. 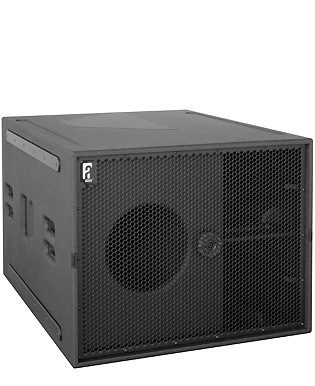 The extensively internally-braced cabinet features features double-tuned, high-pressure loading, through a rounded 236mm diameter low-tuned bass-reflex vent and a wide, high-tuned quarter wave tunnel. This provides optimised breathing at high SPLs, yet keeping the total system weight to a minimum. Slider feet on cabinet bottom and side enable stacking of multiple BQ211’s into vertical LF arrays: The additional front-positioned NL4 connector caters for easy “reverse connection” in cardioid arrays. The BQ211 is powered and controlled by the ALC amplified loudspeaker controller; Through the SDP™ (Speaker Drive Processor) circuit, the ALC offers BQ211-specific drive processing with response optimisation, dedicated power and excursion protection, hybrid filtering and cardoid processing. Through the SIS™ (Signal Integrity Sensing) circuit, the cable-length and connector resistance between the BQ211 and ALC is completely compensated (damping factor 10.000), further increasing response accuracy. The quarter wave pipe principle in combination with a low tuning frequency, forms a true wideband subwoofer with high SPL performance down to the lowest frequencies. Typical applications for the BQ211 include groundstacked sub-bass extension of main sound systems, used in multiples depending on the application and sound pressure level / dispersion pattern control requirements.